The first stop was at the Caldeira Velha. 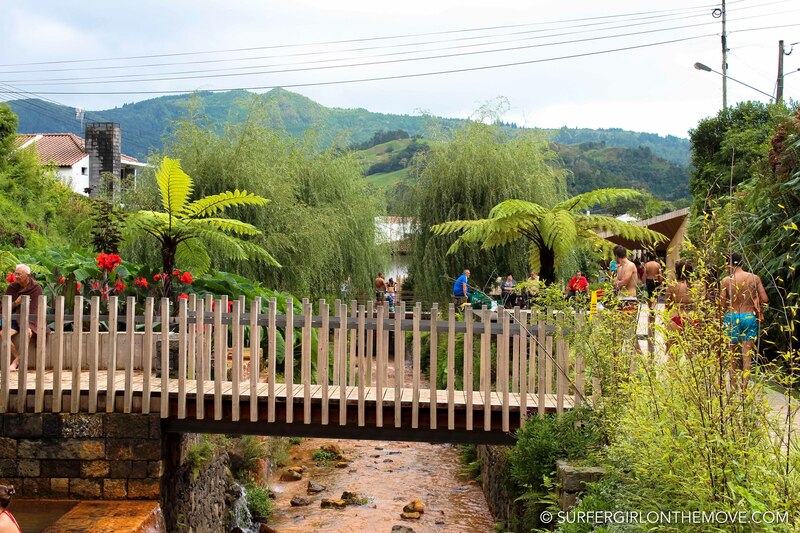 Located on the slopes of the Água de Pau Sierra, as we passed the entrance gates to this park we began to tread a path that leads through dense lush vegetation, following a course of water flowing through the rocks that dot the landscape. The path passes through a geyser, with water bubbling due to high temperatures, and a small puddle serves as an introduction to the baths. 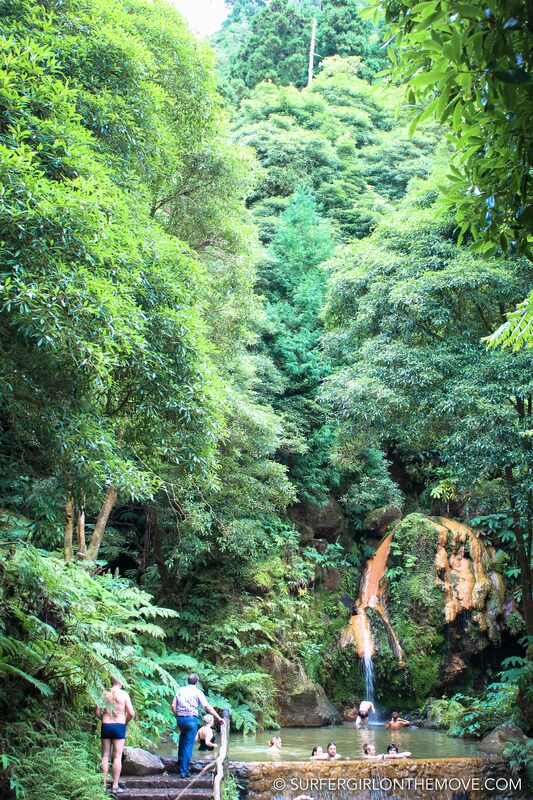 But the highlight of this place is a waterfall under which you don’t resist to put yourself, despite the strength of the hot water falling. 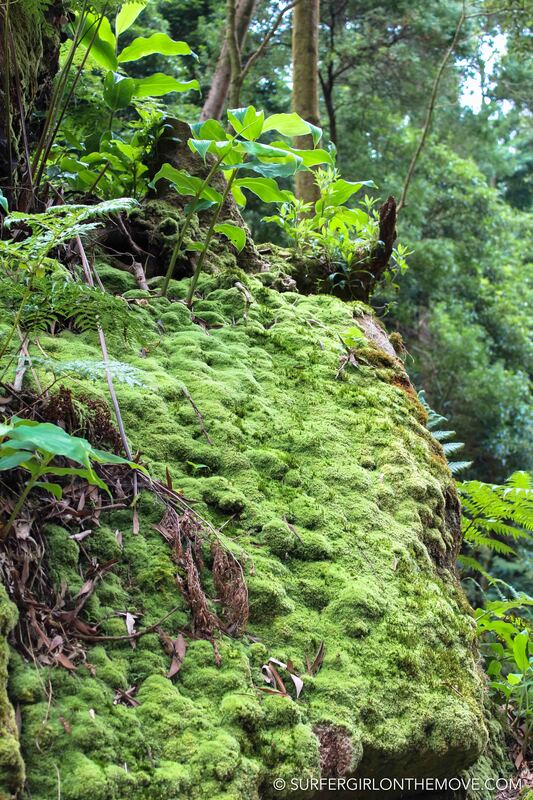 In the Caldeira Velha you can also visit an Endemic Garden, with some regional plants. 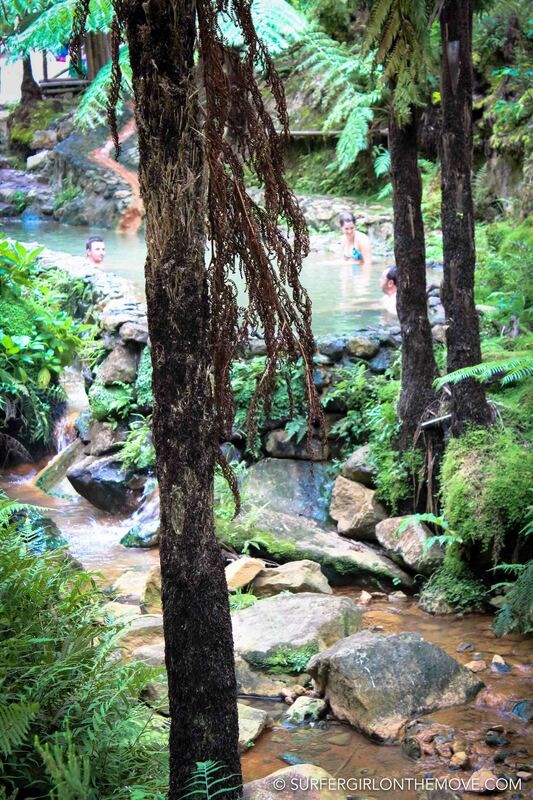 To enter the Caldeira you’ll have to pay 2€, a symbolic price if you consider the natural wealth of the place and the moment of pure relaxation that it offers. 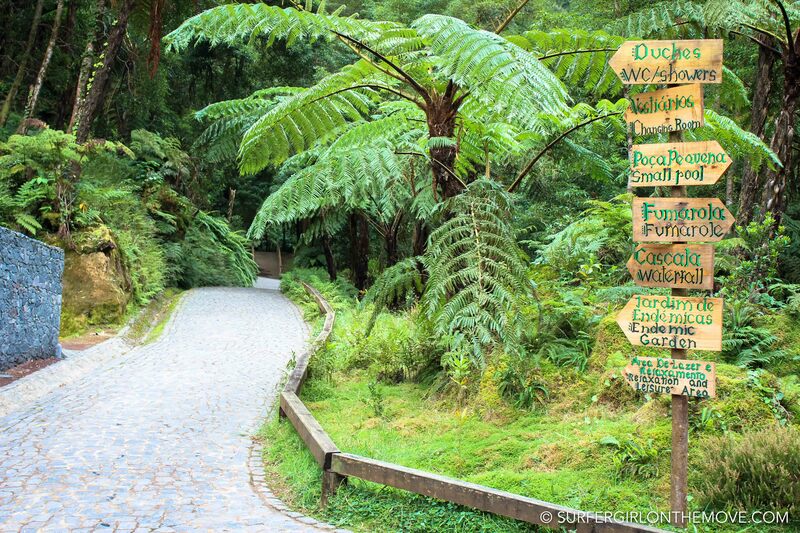 In Poça da Dona Beija, in the Furnas parish, the entrance price rises a bit more: 4€. 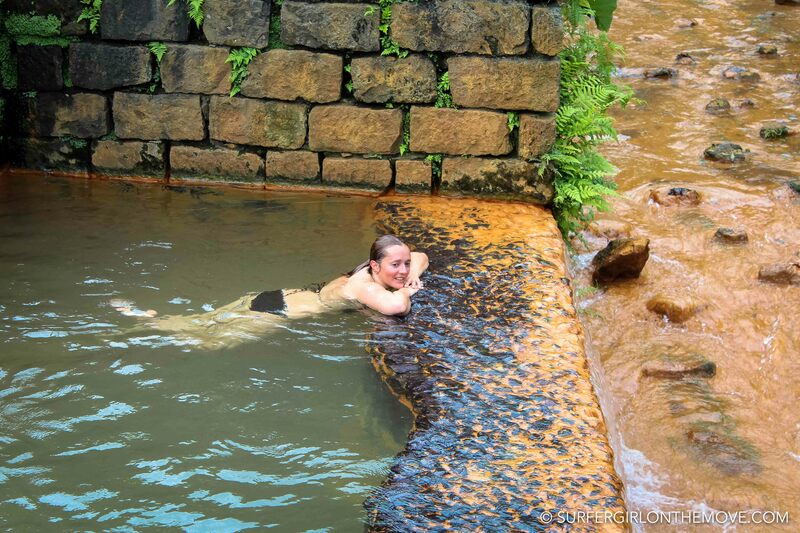 But here too the natural beauty of the place and the various pools or puddles, make you forget immediately the amount charged. 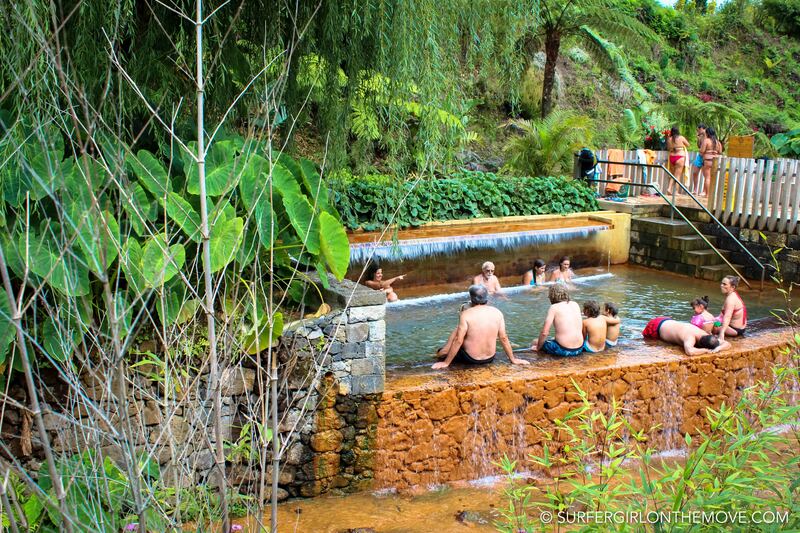 At the edge of the Lameiros water stream, we enter an organized spa area with several springs and three main pools at different temperatures, in a range between hot and very hot. 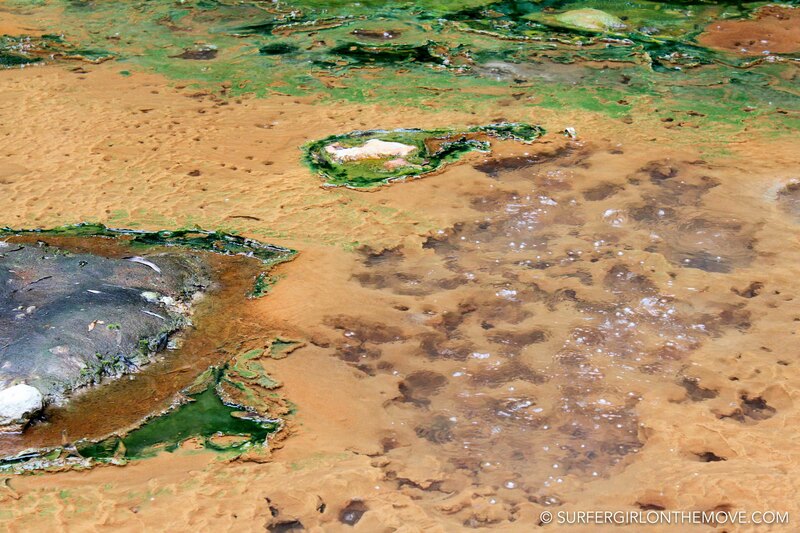 But note that you are bathing in water rich in iron, so it’s not advisable to stay long periods in water. In fact, I overdone it when I was there and at night I was with a little headache and no appetite. Another tip to keep in mind is that the iron water is no friend of the materials that bathing suits are made of, so try to take those older parts that you will not miss if they get damaged. 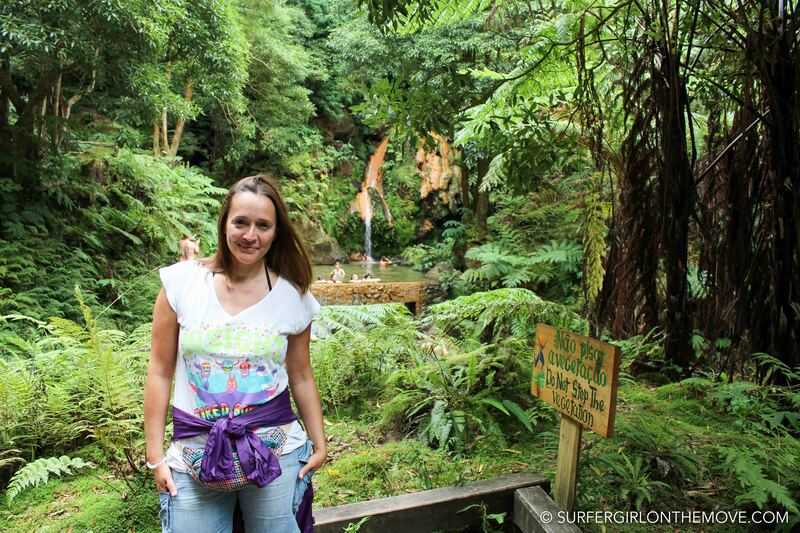 A visit to Caldeira Velha and Poça da Dona Beija should be part of any visit to São Miguel. 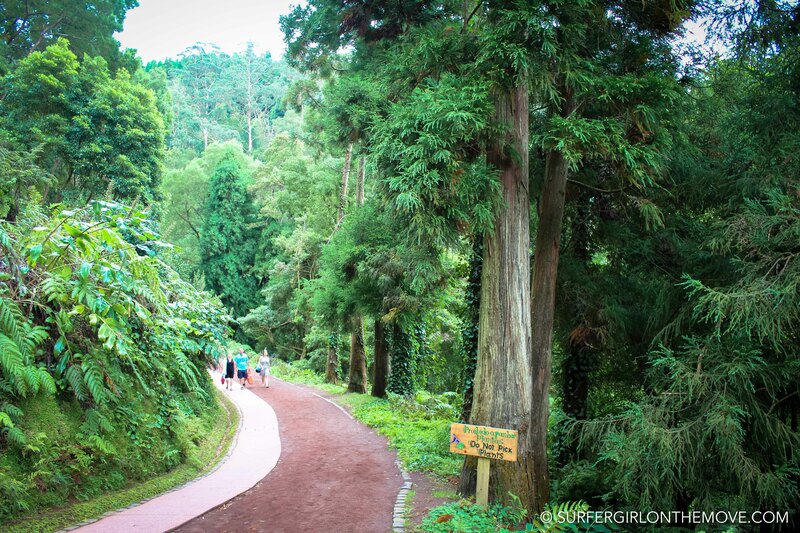 It’s the perfect way to further feel the beauty and inner strength of this island of the Azores. Liked the Post? Save the Pin! These places look simply amazing. It is like you said – you feel like you are going into a paradise. The road to Caldeira Velha si superb! I’d love to visit these part of the world one day! Hi Loredana! You just have to visit it one day. It’s an amazing place. 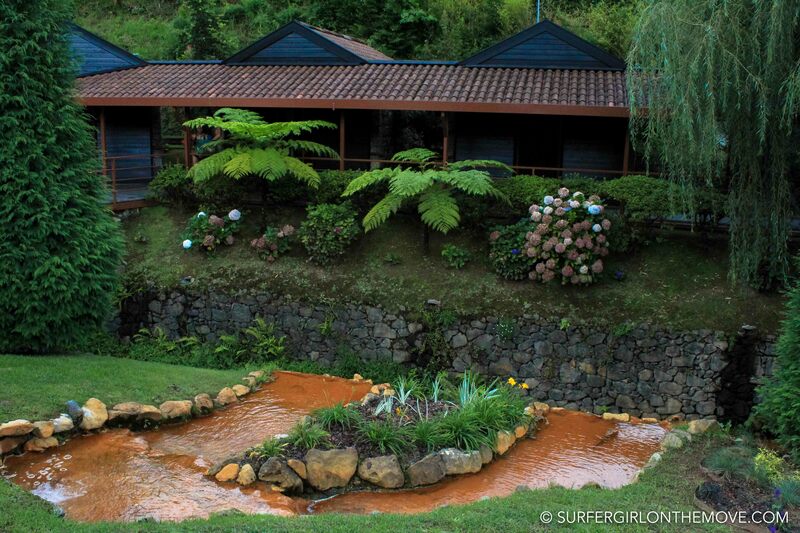 I visited one hot springs in the Azores. 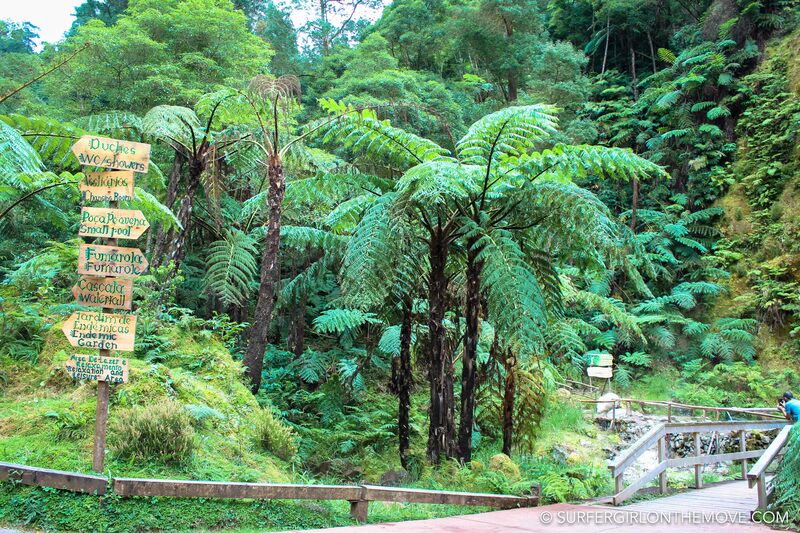 It was in Furnas but I’m not sure it was the same place. What I remember was that the water was yellow! 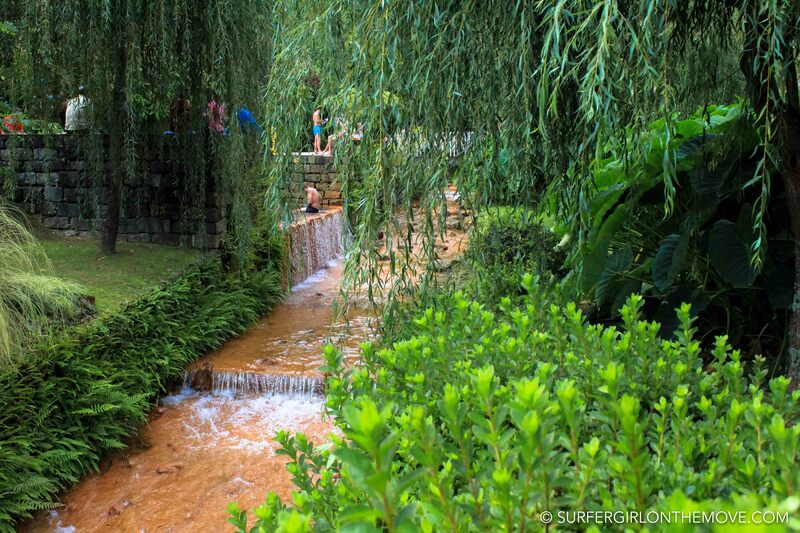 I’m such a hot springs fanatic so I’d love to go back and visit both of the springs that you recommend. 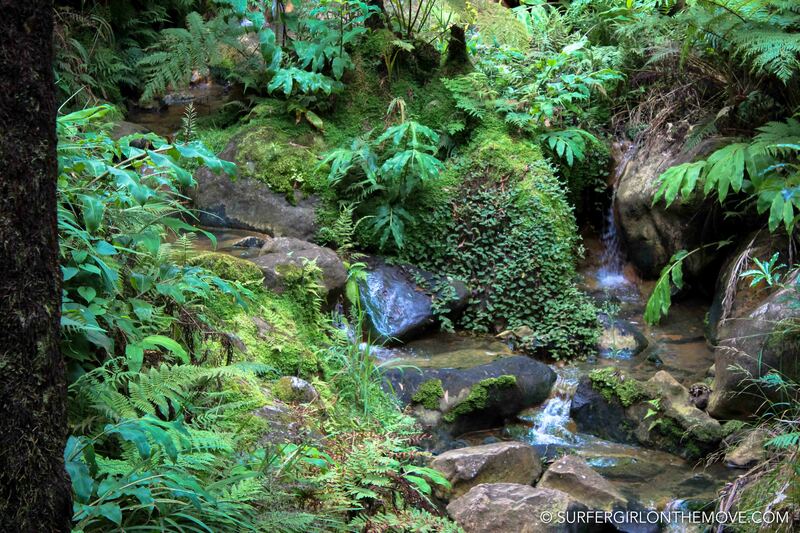 Wow this place looks so wild and exotic like its deep in rain forrest. 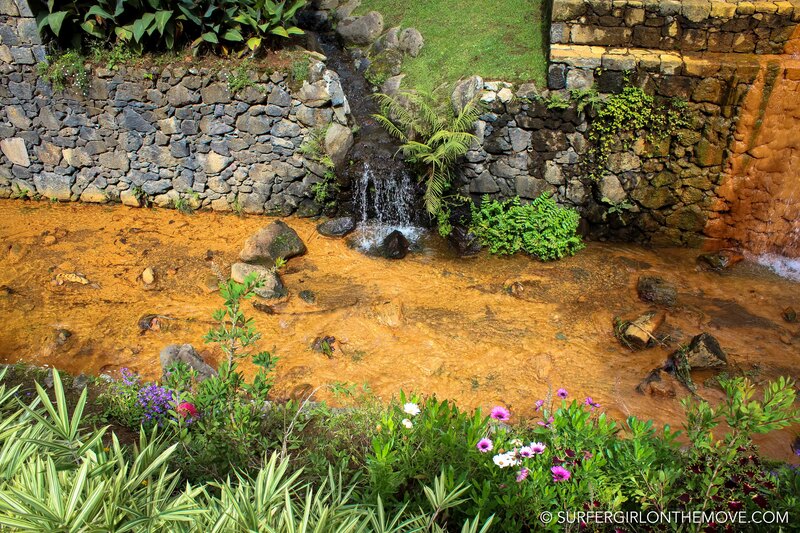 Is the Azores in Portugal or Spain? I love it! Awesome Post! 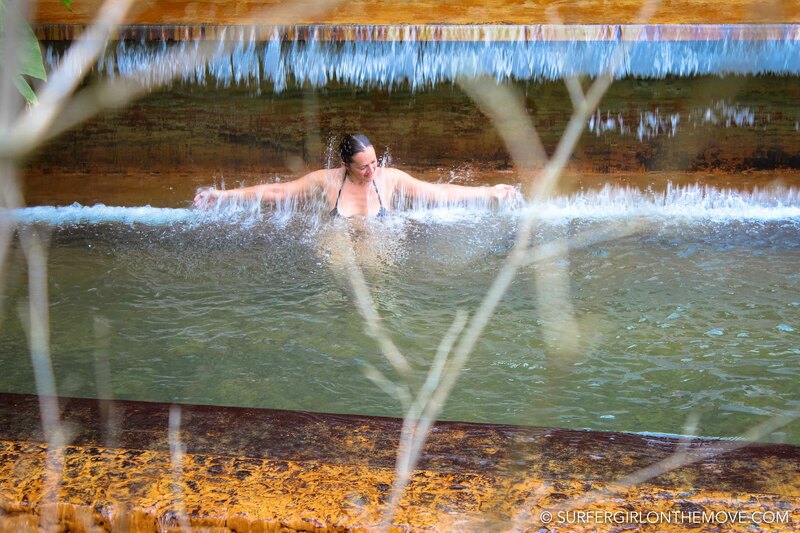 I love thermal pools and hot springs! And you’re definitely right, be careful to not over do it! Wow, what a stunning place and so easy to get to from Europe. I can’t believe I have never been. Definitely need to go there. This place looks amazing! 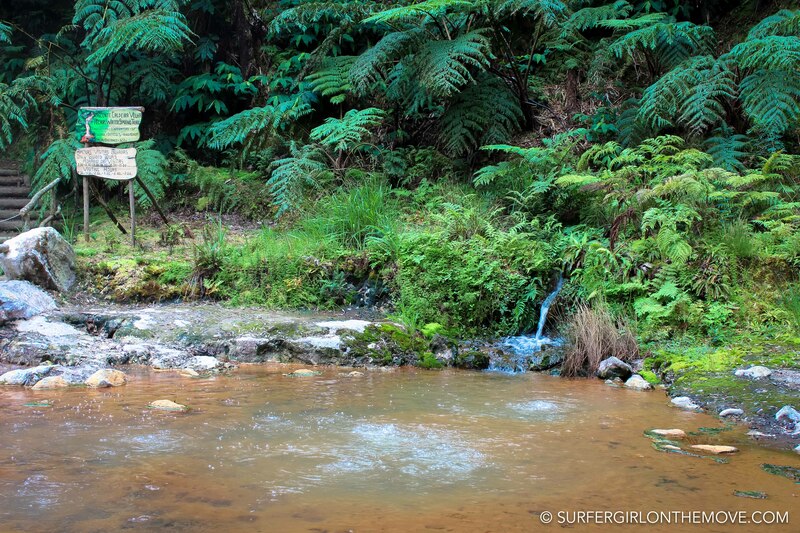 Like a natural water park! I love your photos! It looks so green and beautiful. I hadn’t even heard of these baths. I’ve been to baths in Germany, but they were very different. I’d love to try these! Incredible blog! I aspire to live the life you do. 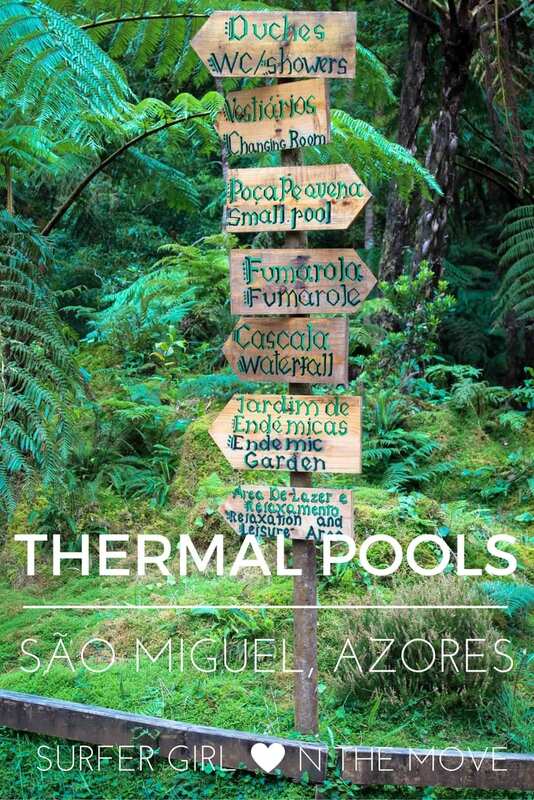 I will be traveling solo to Sao Miguel in mid September. I was wondering if you could provide me with the addresses to such location. Is there public parking? Thanks for all the knowledge!